I love this little ornament. I loved it more when it still had the little red bow that was tied around the top. A dear friend, Liza, gave me this beachy ornament as a reminder of all the fun we’d had together in Key West. Liza used to live there and I had many fun and exciting visits. I liked this ornament so much that I made several and gave them as gifts the following year. Liza made me another ornament before she passed away. This one is very simple but I’ve always loved it. It’s huge and does a fantastic job filling in that hole that every tree seems to have, plus the gold paint does a great job of reflecting the tree’s lights. I have so many wonderful memories of Liza I could overflow the internet if I tried to include them all. Luckily for you, & the internet's storage capacity, many of those memories include things I wouldn't necessarily want my family, children or prospective employers to know about so I won't list them all here. Liza and I met in secretarial school. On that fateful first day of school, we each noticed the other from across the room and instantly took a dislike to each other. I thought she was the most uppity prepster I'd ever seen. She looked like a walking watermelon in her preppy pink & green dress with her pink & green hair bow. An actual bow for goodness sakes! She instantly thought I was the biggest snob she'd ever seen. By the end of the day, we were best friends and inseparable. I decided to share that memory because I just received an unexpected package from another friend, Kate, who I've already mentioned here. Although there was nothing dead or stinky in it, receiving Kate's package reminded me of Liza. In fact, Kate reminds me a bit of Liza. They are both incredibly kind & giving people. Neither of them ever have an unkind word to say about anyone and they always have a smile on their face. Liza's life was cut way too short, but her memory lives on in the hearts of many. Merry Christmas, Liza! And a Merry Christmas to you too, Kate. I LOVE my GU! 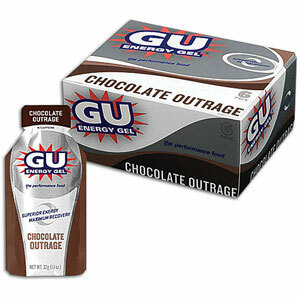 Oh!that Gu is heavenly....almost sinful~is it really an energy food and okay to eat while on those long runs??? I sure hope so..fudgy frosting and brownies all mixed in a handydandysquirty thingy...YUM!